New Roof just installed and new dishwasher coming this weekend! 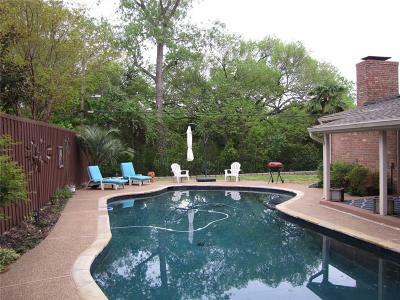 So Close to Lake Grapevine and Oak Grove Park! Desirable Russwood Estates, single story, 4 Bedroom 2 Living area home with the 4th bedroom split! Updated windows, 16 seer Trane Heat Pump, generous closets in secondary bedrooms, window treatments, crown, numerous ceiling fans, updated kitchen with large island and breakfast bar, granite counter tops, and stainless appliances! Great backyard features a lagoon bottom salt water play pool, sprinkler system, large covered patio and storage building. Property backs to Corps of Engineer property for privacy and nature lovers enjoyment. Refrigerator, Washer and Dryer can convey!